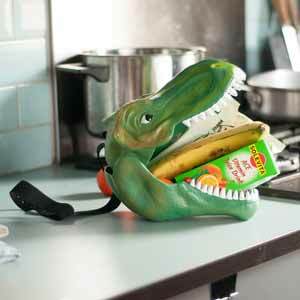 Now here's something cool for the dinosaur nut in your life. My dream is to one day own a dinosaur park - but keep guests out so I can have them all to myself - so I'm probably the perfect person to review this... well, me or a nine year old. First thing to note is not only how strong the plastic is, but also what excellent attention to detail there is. The entire head has a scaly finish to it and the paint job is pretty impressive. In addition the eyes and teeth are painted with gloss paint, so the teeth really catch the light, but more scary is the fact that the eyes are almost lifelike when the light reflects off the blacks of the pupils. There's a handy carry strap which acts to keep the jaws shut, but makes it look like a muzzle to stop the dinosaur from attacking any unsuspecting passersby. 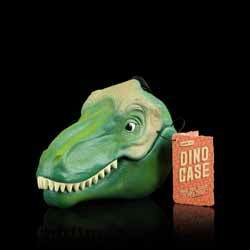 It's something a little different for that dinosaur fanatic in your life. But look around online as a lot of stores are selling it at well over the RRP. At the time of writing this review, Prezzybox was the cheapest.